Our recently-added Hellenic Section centers around a beautiful rock garden with Byzantine cross, memorial benches (available) and floral displays. The Basics: What are the necessities and costs involved? A complete Memorial Estate from a cemetery consists of the Site, Liner or Vault, Liner or Vault Installation charge, Interment fee (the opening and closing of the grave) and a Bronze Memorial Marker on a Granite base. The items required to have a burial consists of the site, the liner or vault, and the interment (the opening and closing of the grave). A liner or a vault is a requirement of the cemetery. (A vault is a little more heavy-duty) Upon request we will put sealer between the lid and bottom half. All Memorial Markers are flush to the ground and can be purchased from the cemetery. All bronze memorial markers require a granite base (the granite must be Sunrise pink and have sawed sides), installation, and perpetual maintenance. Purchase one site, liner or vault and a bronze memorial marker 24"x14" on a granite base 28X18". Purchase Two side-by-side sites, and a liner or vault. The bronze memorial marker can be either 44" x 13" or 44" x 14". The granite is 48" x 18". Purchase a Double Depth site. A double depth site requires a two tier crypt which can be purchased from the cemetery. A two tier crypt is used to put one interment on top of another. If a family wishes this type of burial a Double Depth site must be purchased before the first interment. The bronze marker is 16"x24", the granite base is 20"x 28". Cremation Burials. 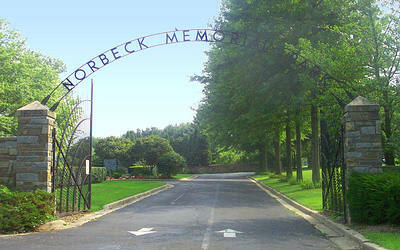 Cremations can be in ground or in a Columbarium Niche. In-ground cremations require a cremation vault. The in-ground bronze marker is 11 1/2"x11 1/2", the granite base is 15 1/2"x15 1/2". The Columbarium Niche does not have a bronze, it requires incising. There cannot be any cardboard containers.